Winston’s Removal & Landscaping will walk you through the full process of creating your backyard oasis. Starting with a simple idea or concept, Arch’s team will make sure your landscape is properly designed and installed for decades of enjoyment. Our professionals are highly-skilled and can work with you and your budget to create areas of natural beauty that your neighbors will admire. Whether you are looking to create a backyard botanical gardens or simplify your yard into a maintenance free oasis, we have the expertise and tools to ensure a happy, healthy backyard. 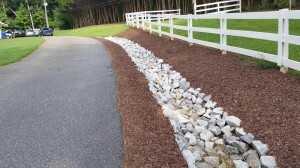 Our installation services include but are not limited to installation of sod (fescue, zoysia, bermuda), plants, trees, shrubs, flowers, ground cover, river rocks and stone borders, boulders, mulch and pinestraw. Tired of dying landscapes? We can also revive planting areas by reworking the soil and moving existing plants or landscaping to make sure plants are thriving in their environment. Want to change the slope of your yard to provide better water flow or just change the usable space in your yard? Our professional grading services will provide you with the solutions you need to make your lawn truly work for you. Adding a patio, shop, garage, or usable land can radically change the functionality of your outdoor space, providing you with enhanced beauty, increased work-space, or extra space for entertaining. Have land & looking to build on it? Our crew can grade the area to build your house, shop, etc. 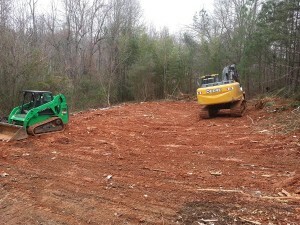 Winston’s Removal & Landscaping provides one-stop solutions for creating all of these spaces on your property. Is your yard wasting way, or does that once-small trickle through your yard look like it’s becoming a river? Not only is that unwanted water annoying, it can affect the stability of the foundation of your home or office. 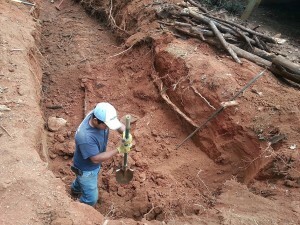 Winston’s has the experience to solve your erosion or drainage problems. We will locate the source of the problem and come up with the right solution for your property. Our experienced crew can install corrugated drainage pipe, French drains, catch basins, & dry river beds to solve all of your drainage needs. We also install wood, concrete, or stone head-walls for drainage, which prevent driveways from washing away. Do you need sinkhole repair services? These voids created by plumbing leaks or erosion, leaving walls and slabs unsupported can sacrifice the integrity of your lawn. Sinkholes are created in various ways. Sometimes, it’s environmental or weather-related, but other times builders bury their debris while building homes. That does nothing more than leave you – the homeowner – with a sinkhole. We will repair any sinkholes on your property- regardless of how they got there, making your property safer and more viable. 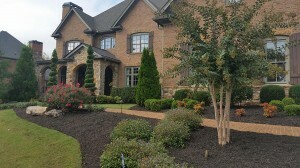 Visit our Project Gallery to view photos of our recent Landscaping Projects.